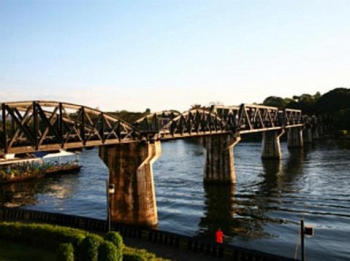 Literature and film have made the Kwai world-famous: "The Bridge on the River Kwai" from the novel of the same name still stands in Kanchanaburi. However, there are many other places which are worth visiting. A Kwai River Cruise has many other aspects and faces. Thai culture and religion, landscapes and nature, lifestyle and tradition are all on the itinerary. The Kwai is a river in central Thailand. It rises in the Tenasserim mountains of northern Thailand and flows to the point of its confluence with the Khwae Noi after some 380 km at the city of Kanchanaburi in western central Thailand, where the two rivers form the Mae Klong. The best time for a Kwai River Cruise is between December and May. The city already mentioned above, Kanchanaburi makes its living from trade and, above all, from tourism, for this is the site of the famous bridge. The Wat Pa Luangta Bua temple is also interesting due to its open tiger enclosure. Close by is to be found the Erawan National Park with its spectacular, seven-tiered waterfall and impressive caves. Go on a Kwai River Cruise and create a bridge to a centuries-old culture. Here you can discover typical floating houses, traditional clothing and trade. See for yourself the synthesis of history and modernity and open yourself up to a journey of a special kind.